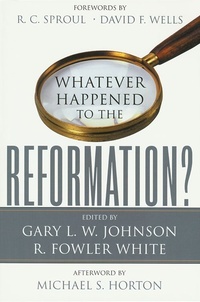 Bruce Ware, Darryl Hart, John MacArthur, and others join the editors in calling evangelicals to recover their Reformation roots. Too many evangelicals believe methodology and results trump theology. To reach a postmodern society they too readily adopt an unbiblical view of God that many Americans find more palatable. Or they subsume Bible study and preaching to secondary status. Whatever Happened to the Reformation? urges us to turn to the theology of the Reformers and allow it to shape every aspect of church and family life. Take it and read!